11. A Bug's Life - For me, for all of it's technical achievements at the time, it just doesn't have the story to make me want to watch it over and over again. 7. Ratatouille - I think this movie is really really good! We all HATE rats in real life, and yet this one is adorable...The animated Paris is something to behold and the story is underrated. I thought all of the casting was spot-on as usual, but was critical for this movie, as it's not your usual kid's movie. Me and my family always enjoy this one too. 5. Up - The first 5-10 minutes sucked me right in emotionally (I cried) and then the rest of the movie had me laughing hysterically throughout. The end credits were touching too, showing how the main character's adventures were really just the beginning. 2. Wall-E - While I know many people who just flat out hate this movie, I don't understand why...I love the story, how the storytellers instill so much love and emotion in a robot that shouldn't be able to "love" or "feel" anything. They tell a backstory while practically saying NOTHING. The animation in my opinion is the best I have ever seen to this day, it's incredibly realistic and nearly 3 dimensional. Based solely on how much I enjoyed the movie - at the time I first saw it - with no regard to technical achievement, casting, plot or any other parameter. I like all of them so there is no bad or "worst" movie, but Ratatouille is probably my least favorite. This isn't all the Pixar movies is it? Wasn't Shrek a Pixar film? What about Monsters vs Aliens? If not, surely this set isn't all of them. This list isn't very subjective, as the only one I didn't care for was Ratatoille. We've watched it once, and it has been collecting dust ever since. I haven't seen those three yet, so I didn't list them. 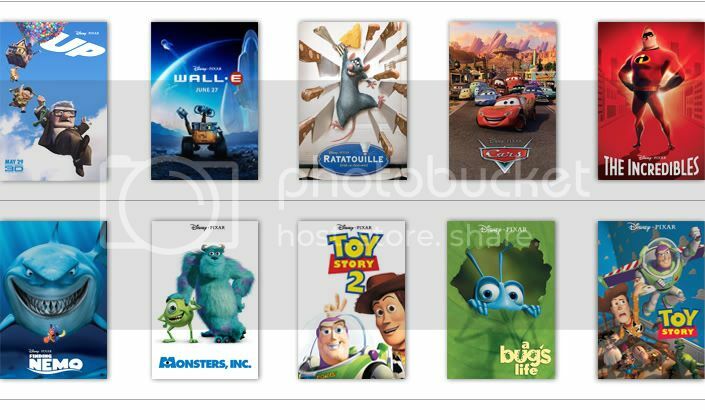 So, there is only 11 "Pixar" films total? I kept thinking there were more than that. One thing I realized putting this list together is that I really like all the Pixar movies very well. The difference, for me between these movies is pretty small. The only one easy for me to place was The Incredibles. #1 - Cars - even if the story isn't terribly original, this one has an emotional impact on me that the others don't come close to. Maybe 'cause I grew up in a small town in the SW? Not sure really. I just think this one's really well done in every way. 5- Up - hard to place this one, sometimes I feel really good about this one, other times it just doesn't do it... not sure why. 8- Wall-E - the chick robot was irritating, as were the "blob people"